Use the Biml editor to edit Biml files. 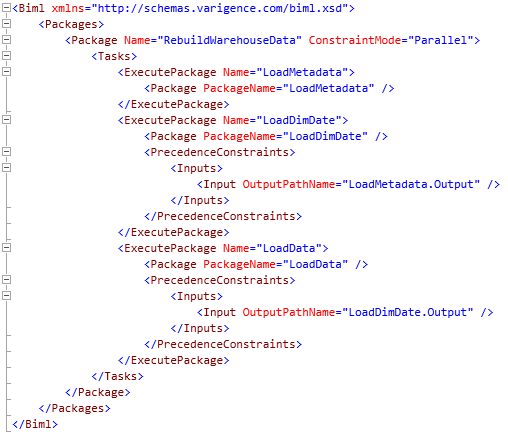 Every item in the Logical View has an associated Biml file. While the item's editor and the property grid can typically provide complete customization for an item, it may be convenient to alter Biml directly. Syntax highlighting, quick info popups, and Intelliprompt are all available. Paste Paste text from the clipboard into the Biml document. Cut Remove selected text from the document and place it on the clipboard. Copy Copy selected text to the clipboard. Font Choose a font for the Biml editor text. The default is Consolas. Size Choose a text size for the Biml editor text. Def Returns font related settings to their defaults. Type Choose a type of text to change its foreground or background color. Background Select the background color for a type of text. Foreground Select the foreground color for a type of text. Find Opens the Find and Replace tool window. Show Intellisense Displays an Intelliprompt popup at the cursor location. 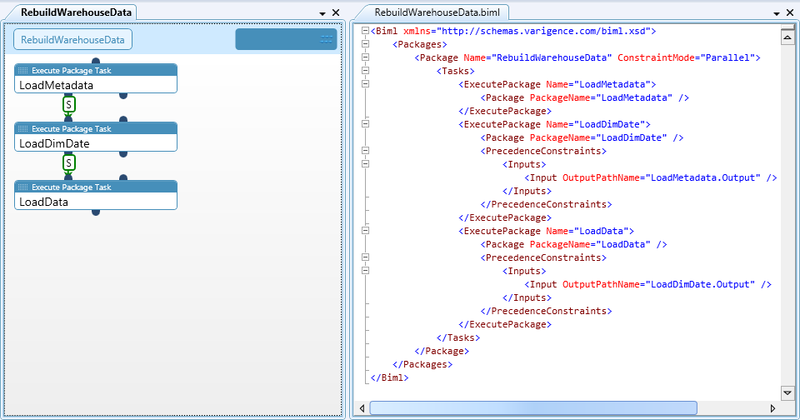 Toggle All Choose to toggle regions in the Biml document. Include File Add a new or existing Biml include file to the open project. Emittable File Add a new or existing Biml emittable file to the open project. Instant Recompile Immediately recompile the Biml file. Add Add a project configuration. Remove Remove a project configuration.